People in Cornwall have been giving their reactions after snow brought most of the county to a standstill. At least 1,000 people were left trapped in vehicles as the A39 on Bodmin Moor ground to a halt. The RAF had to fly in emergency food supplies to more than 300 children stranded at Newquay's Treviglas School. On Friday night emergency services urged people not to travel unless absolutely essential and to listen to local radio for news. The A39, near Jamaica Inn, was one of the worst affected areas with hundreds of people reported stranded in their cars from Friday lunchtime. Mike Collenzo, manager of the nearby Jamaica Inn, said he had filled 17 of his rooms with drivers who had abandoned their cars for the night. He said: "I've never seen anything like this up here. Speaking to a few older locals, they've said it's not since the 60s they've seen weather like this." Restaurant supervisor Luke Halls said "For the last couple of hours traffic has not been moving at all. Motorist Wyndham Proctor said: "Fortunately my wife sent me out with sandwiches this morning so I'm not hungry, but I wouldn't mind a stiff whisky right now. "I've got a big coat in the back in case I have to spend the night here. "Other people are either running out of fuel or running their batteries down trying to keep warm. "I shall be very glad if I'm home for breakfast." There was growing concern as to when people would be rescued. PC Terry Hodgson - from Devon and Cornwall police - said: "It's going take as long as it will safely take. "We're working as swiftly as we can, as I say there are a large number. "We do need to keep obviously a good log of the vehicles and the individuals concerned and remove them safely to the rest centres. "We've had no reported injuries or any illnesses and fortunately the people are working with us and we're removing them as swiftly as we can." 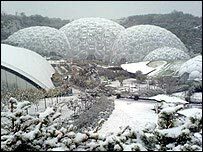 Devon and Cornwall Police criticised drivers for not heeding warnings to stay at home and Philip Eden - from the Royal Meteorological Society - said that people should have known this sort of weather was coming. He said: "This is a bog standard northerly outbreak that we used to get half a dozen times every winter in the 70s and 80s, but they just don't happen any more. And we really have disconnected with our own climate and forgotten that we do get these sort of things --- and we have to - or we really ought to - make allowances when the weather forecast tells us that we're going to have a substantial amount of snow."